A Leopard Trapped in a 60 Foot Well. It took a village to rescue the Leopard. Made me think of the proverb, “It takes a village?” Fortune 500 companies have taking this proverb and associating “It takes a village,” as a way to communicating teamwork and culture. Same as Hillary Clinton’s publisher used in her book title, “It takes a village.” Yet the full African Proverb is “It takes a village to raise a child.” Now I don’t know if this ancient African proverb “It takes a village to raise a child,” works for you but it sounds like a pretty good proverb to me. In this video you will see an example of “It takes a village,” in action. My congratulations to villagers of Junnar, Maharashtra. You did an awesome job of filming and saving this Leopards life. Not only that the professionals at Wildlife SOS were used. The Leopard is rescued. Watch the video below and see first-hand of the “It takes a village,” principle and the ways of the Leopard. What makes this video so interesting is that humans can be like this Leopard. Only I want to use the 60 foot trap as a metaphor that we create in our minds. Our thoughts make mountains out of molehills. Or if forget the metaphor maybe you’re really trapped in a 60 foot well. The bottom line is no one gets out of life without facing some kind of trouble. It can range from bankruptcy, addictions, or just looking for work. The thing to remember is when riding the rainbows of success it’s easy to respond to difficulties. Only when the chips are down or you’re stuck in a 60 foot trap like the Leopard is how we can make the difference with our lives. So what do we do when trapped, alone, and desperate? Are you struggling in a financial situation, job search, or looking for that new business or personal relationship? This Leopard rescue is just a metaphor for another way to look at life. It’s the purpose of me sharing this blog post. First: (Stay Calm) Notice how the Leopard was calm. It wasn’t splashing about, tearing the place up, or acting the fool. It didn’t ask for sleeping pills. Yes the Leopard was scared and in a state of panic according to Dr Ajay Deshmukh of the Leopard rescue center but it didn’t show it. Not like I do when wanting to find my cell phone. Second: (Teamwork) I saw a team (village) of people around the Leopard. Made me think the world doesn’t conspire against me but for me. It was the Team / Village pulling to free the Leopard out of a trap. I saw the wisdom in building teams and teamwork. Are you using Teams and Teamwork in your situation? Like right now what is your 60 foot trap today? Do you know if you have a 60 foot trap in your life? Once you’ve signaled out your 60 foot trap look to see what team is supporting you. If you don’t have a team then get a team. Third: (Stop resisting) The way of the Leopard was awesome when help arrived at its level. The Leopard checked the gate, the box, and the material by biting and clawing. Is this a reliable escape structure? Was the escape box structure dangerous? The bit or claw proved it was safe. And in a way the Leopard tested what was being presented. Because when you’re in a trap or down and out some times a scallywag or two could show up. The great thing I saw about this Leopard was how fast it gave up fighting the escape box structure and trusted what was happening. Made me think….What am I resisting? What am I biting at or clawing at? Have I given up resisting the very thing that solves my problem? Furthermore a Team of people are working with me not against me even though I might not be related to the team like the wild cat is not related to humans. All together I resist a solution to a problem because I have an attachment as to how the solution to my problem should look? So I want to tell myself to stop resisting the solution right in front of my face. 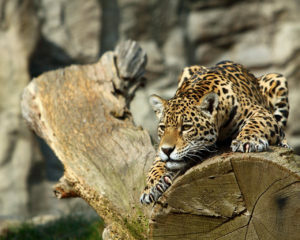 Four: The Leopard never makes itself wrong about being in the trap. To me it looked as if the Leopard didn’t care what the other animals thought of it for being in the trap. It could care less of the humans staring at it. The cat to me showed No judgement or Self-blame. It was just a beautiful Leopard in a 60 foot trap waiting for the opportune moment. Are you currently in a 60 foot trap? Are you making yourself wrong for being in the trap? In conclusion take on the way of the Leopard.